Fat people have historically been seen in Western culture as monstrous, excessive, and dangerous, to themselves and others, because their physical and discursive identities violate the boundaries of cultural tastes. Following a history of other marginalized cultures, including disabled and queer people, one way of disempowering dominant cultural ideologies about fatness is to embrace the allegedly negative identities ascribed to fat people. Yet over more than 40 years of fat and disability activism in the West, beauty has remained for many an ideal toward which to strive. Contemporary fat activism, both radical and assimilationist, focuses largely on “expanding” the definitions of beauty. Fatness, it is often argued, should not be seen as a moral failing, because everyone can be beautiful, even fat people. The fight against fat oppression seems short-sighted when it targets beauty as its goal, however, because the concept of beauty tends to reify mainstream power imbalances and systemic oppressions targeting people of color, disabled people, and fat people. 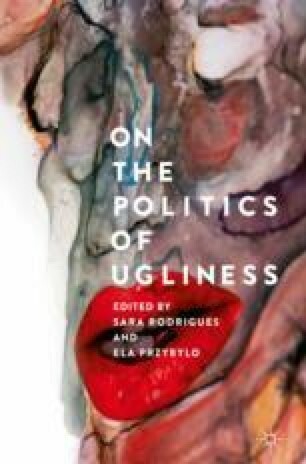 This chapter looks at contemporary self-portraits of fat artists by two photographers, Chicana artist Laura Aguilar and Finnish artist Iiu Susiraja, in order to examine the reasons why a politics of ugliness should be more actively used by fat activism as a strategy for queering mainstream cultural norms. This analysis builds upon work by scholars and activists in Art History, Fat Studies, and Disability Studies who have embraced notions of the mundane, the abnormal, and the ugly as non-pathologizing ways of considering representations of fat, queer, and crip bodies. Allison, Michelle. 2008. The Obligation to be Healthy at Every Size. The Fat Nutritionist, March 18. http://www.fatnutritionist.com/index.php/the-obligation-to-be-healthy-at-every-size. Accessed 18 Dec 2015. Association for Size Diversity and Health. n.d.. https://www.sizediversityandhealth.org/index.asp. Accessed 30 Dec 2015. ———. 2017. Health at Every Size. http://haescommunity.com. Accessed 30 Dec 2015. Carmona, Richard. 2006. Lecture at the University of South Carolina quoted in Gina Pace, Obesity Bigger Threat than Terrorism? CBS News, March 1. http://www.cbsnews.com/news/obesity-bigger-threat-than-terrorism. Accessed 17 July 2012. Fishman, Sara Golda Bracha. 1998. Life in the Fat Underground. In Radiance: The Magazine for Large Women, Winter. http://www.radiancemagazine.com/issues/1998/winter_98/fat_underground.html. Accessed 9 Mar 2018. Frank, Priscilla. 2014. Artist’s Strange and Beautiful Images Challenge Our Definition of the Selfie. The Huffington Post, October 20. http://www.huffingtonpost.com/2014/10/20/iiu-susiraja_n_6004232.html. Accessed 11 Jan 2016. Glock, Allison. 2015. Melissa McCarthy: The Art of Living Fearlessly. More Magazine, June. http://www.more.com/entertainment/celebrities-movies-tv-music/melissa-mccarthy-art-living-fearlessly%20?page=2. Accessed 12 Jan 2016. Jolley, Ben. 2014. Iiu Susiraja’s Body Talking Selfies. Dazed, October 15. http://www.dazeddigital.com/artsandculture/article/22129/1/iiu-susirajas-body-talking-selfies. Accessed 11 Jan 2016. Jones, Substantia. n.d. The Adipositivity Project. Adipositivity.com. Accessed 9 Jan 2016. Lupton, Deborah. 2012. Sociological Critique of the Health at Every Size Movement. In This Sociological Life. September 24. https://simplysociology.wordpress.com/2012/09/24/a-sociological-critique-of-the-health-at-every-size-movement/. Accessed 28 Dec 2015. Marketdata Enterprises, Inc. 2015. The U.S. Weight Loss Market: 2015 Status Report and Forecast, January. https://www.bharatbook.com/healthcare-market-research-reports-467678/healthcare-industry-healthcare-market-research-reports-healthcare-industry-analysis-healthcare-sector1.html. Accessed 28 Dec 2015. McCarthy, Melissa. n.d. Seven7. https://melissamccarthy.com/. Accessed 12 Jan 2016. Mingus, Mia. 2011. Moving Toward the Ugly: A Politic Beyond Desirability. Keynote Speech, Femmes of Color Symposium. Oakland, August 21. Published on Mingus’ blog, Leaving Evidence, August 22. https://leavingevidence.wordpress.com/2011/08/22/moving-toward-the-ugly-a-politic-beyond-desirability/. Accessed 15 Dec 2015. National Association to Advance Fat Acceptance. n.d. About NAAFA: Our Mission. http://www.naafaonline.com/dev2/about/index.html. Accessed 15 June 2017. Nochlin, Linda. 1999. Offbeat and Naked. Artnet.com, November 5. http://www.artnet.com/Magazine/FEATURES/nochlin/nochlin11-5-99.asp. Accessed 13 Jan 2016. Nudd, Tim. 2013. Special K Tries to Stop Women Who “Fat Talk” by Confronting Them with It: Empowering or Just Odd? AdWeek, December 11.http://www.adweek.com/adfreak/special-k-tries-stop-women-who-fat-talk-confronting-them-it-154428. Accessed 15 Dec 2015. Obama, Michelle. 2010. Speech at the Conference of Mayors, Washington, DC, January 20. http://blogs.suntimes.com/sweet/2010/01/michelle_obama_obesity_is_also.html. Accessed 13 Jan 2016. Sidibe, Gabourey. 2015. Empire: Gabourey Sidibe Blogs the Latest Episode of Empire, “A High Hope for a Low Heaven.” Entertainment Weekly Online, November 5. http://www.ew.com/article/2015/11/05/empire-gabourey-sidibe-blogs-high-hope-low-heaven. Accessed 12 Jan 2016. Special K website. n.d. Our Story. https://www.specialk.com/en_US/our-story.html. Accessed 5 Jan 2016. Special K YouTube channel. n.d.. https://www.youtube.com/watch?v=WEIFlSBodVM. Accessed 15 Dec 2015.